This article was originally published in the December 2016 issue of the Soil and Water Conservation Society Conservogram newsletter. As a faculty advisor to students in agronomy, soils, and environmental science, one of the most rewarding parts of my job is seeing students excited to begin their first job out of college. In the agronomy profession recent graduates have been blessed with a sustained job market, which has alleviated some job search-related stress. However, for students who wish to follow a career path into conservation of soil, water, and other natural resources, the hiring process is far more cumbersome and uncertain than necessary. Currently, hiring practices for positions in federal agencies such as the Natural Resources Conservation Service (NRCS) have resulted in a lose-lose situation for both the agency, and for the students wishing to pursue careers in conservation through civil service. The problems are numerous, and begin with the recruitment process itself. For students graduating in the spring, the best students usually have been offered and have accepted positions around February of their senior year. However, federal agencies competing for these same students rarely take student schedules into consideration, greatly shrinking the pool of well-qualified candidates to recruit. Once a position is listed on usajobs.gov, oftentimes it will be listed for less than two weeks, and in extreme cases only for one day! Should a student be lucky enough to find a job listing that interests them, there are no knowledgeable technical staff available to answer questions regarding details of the position, such as how much time they will spend in the field or office, what the primary job duties will be, how much travel will be involved, etc. Once a candidate does apply, they encounter a lack of consistency regarding general schedule (GS) classifications, with two seemingly identical positions being listed at two different classifications, and thus different starting salaries. They also encounter qualification questions that may or may not be relevant to the position, and that have no mechanism for follow-up to determine if candidates were truthful in their answer. Once an application is submitted, results or feedback related to their application is slow-to-come with little guidance, if any, from informed staff. To make things worse for government agencies wishing to hire the best graduates, the current and increasing shortage of college graduates in agricultural science and engineering disciplines, combined with increasing competition from industry, has driven starting salaries higher and higher. All of these issues described above, combined with the drastic difference in hiring procedures between federal agencies and industry, has resulted in decreased competitiveness of government agencies for top-notch talent. As a result, the best and brightest students are forgoing conservation-focused careers in the public sector, and are instead pursuing careers in industry. Further, under current hiring practices, federal agencies are left with small, potentially underqualified pools of candidates from which non-technical staff are making hiring decisions for technical positions. This is the definition of a lose-lose scenario for both the candidates and the federal agencies wishing to hire them. I encourage government agencies, particularly those related to soil and water conservation, to reevaluate and revamp their hiring practices. The win-win scenario for both the agencies and the candidates starts with modeling federal hiring practices after that of industry. This can be done by i) increasing involvement of technical staff in the hiring process, ii) allowing immediate supervisors to make final hiring decisions, iii) increasing job posting windows to at least one month (and longer if possible), iv) improve user-friendliness of the application and hiring process, and v) begin recruiting students on the same hiring schedule as all other potential employers. These changes will facilitate the hiring of the most qualified students to most effectively carry out the missions of government agencies. If you’re reading this as a student who would like to become a civil servant in the soil and water conservation field, then I have a two suggestions. First, be aware that the current federal hiring process is very different from that of industry; but if that is your goal, have patience. Also, do everything in your power to get your foot in the door early, such as volunteering with your local soil and water conservation district or getting a position as a student trainee with the NRCS. Access the full December 2016 Conservogram at this link. Colby Moorberg is an assistant professor of soil science in the Kansas State University Department of Agronomy. He teaches soils, soil and water conservation, and other soil science courses in addition to serving as a faculty advisor and conducting research. He is a former member of the SWCS Board of Directors and currently serves as the chair of the SWCS Professional Development Committee. To go with that them, here’s a link to a previous post on this blog about urban gardening. Next month’s theme is Soils Support Agriculture. Stay tuned for a blog post and videos related to that theme! Thanks for stopping by! Along with the trends of buying local food, buying organic, etc., there seems to be an increase in (or perhaps more accurately, a return to) gardening – especially in urban areas. Urban gardening is a great way to save money on food, a great source for fresh vegetables, and an easy way to introduce kids to where the food on their plate comes from. In fact, working with the soil has been proven to make you happier! However, there are a couple potential obstacles you should consider first before starting your urban garden. First, in urban environments the possibility that soil could have been contaminated with heavy metals, petrochemicals, etc. is pretty high. Lead (which was once a common additive to gasoline and paint) is common in urban soils and can be adsorbed by the roots of the vegetables you grow. Because of this, that lead can eventually end up in the food on your plate. Most lead poisoning comes from ingesting lead (like eating lead paint chips…), so it’s important to know that the soil you’re using for your garden is safe. You should take some soil samples and send them to a lab in your state that can test for heavy metals like lead. Usually the “land grant” university in your state (in the US) will have a soil testing lab where these tests can be performed for a nominal cost. Other forms of contamination are possible as well, such as chemicals from cars, asphalt , laundry-mats, etc. These chemicals are more difficult to test for, so your best bet is to find out the history of your garden plot. These records should be available from your local city government, perhaps even online. Second, urban soils are often compacted from foot, car, or perhaps machinery traffic. Compacted soils make it difficult for plants to grow, mainly because the plant roots are not strong enough to penetrate the compacted soil, and thus cannot gather enough water or nutrients for the plant to survive, let alone grow and produce vegetables. Compacted soils are especially common in newer housing developments where entire blocks of houses were built around the same time. The construction companies often remove all of the topsoil prior to building the houses. The soils are then driven over by construction machinery and compacted. Then sod is laid directly on top of the subsoil. This makes for soils with very poor growing conditions for both lawns and gardens. A good alternative for areas with either contaminated or compacted soils is to use a raised garden plot with soil that was brought in from a reliable source. You can buy bags of potting soil from a local home and garden supply store, but a more economic alternative is to have a trailer full of topsoil trucked in to your backyard. When you build your raised garden, be sure not to use wood that has been treated. Some of the chemicals used to treat lumber are designed to kill fungi that break down wood. These chemicals (such as arsenic) can leach out of the wood and into the soil used for your veggies! However, untreated wood, though it might not last as long, will still last for decades and is probably cheaper anyway. 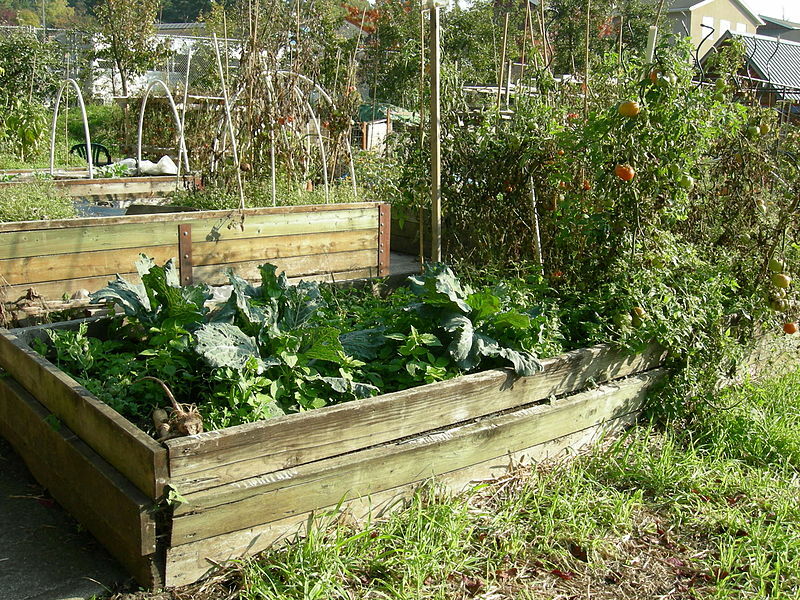 There are lots of great designs and how-to sites that show you how to build a raised garden bed. Here’s one example from “This Old House”. Space is also another consideration. If you don’t have the space for a garden or a raised garden, then perhaps you need to think outside the box (raised garden pun intended). Container gardening is popular in urban areas, and it’s what I’ve done for the last decade or so that I’ve been in college. 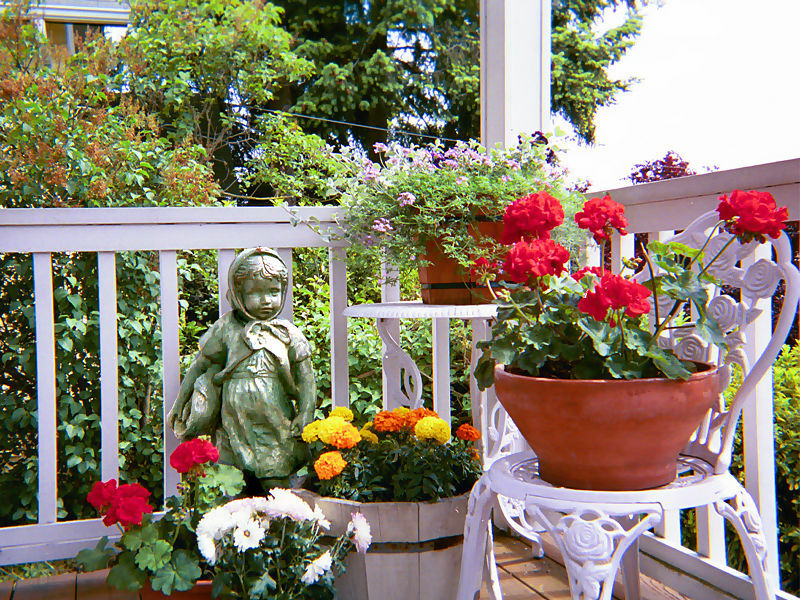 Container gardening is exactly what its called – growing ornamental or vegetable plants in containers. Containers can be traditional plant pots, buckets, plastic totes, or any other container with an open top. Vertical gardening is a version of container gardening that uses your space available most efficiently. Much like using shelves to save space inside your home, vertical gardens use shelves, stairs, racks, etc. to make use of vertical space outside of your home for gardening. The options for vertical gardens are only limited by your imagination. In this How-To, Heather Foust gives a good example (and directions) of making a vertical garden using a pallet and some other supplies (shown left). Also, here’s an interesting article from the Christian Science Monitor about vertical gardening in urban areas. The main disadvantage of container gardening is that you’ll likely have to water more frequently, but there are strategies to overcome that problem – see my prior blog post about saving water with container gardening. Another good resource is the University of Illinois Container Successful Container Gardening website. In summary, the biggest obstacles to urban gardening are soil contamination, soil compaction, and space limitations. I’ve given you a few good alternatives to overcome those issues. Also, be sure to fertilize appropriately, lime as needed, and make sure the plants that you pick are appropriate for the sunlight that’s available. Your local garden supply store can help you with suggestions on those issues. If you know of an urban gardening obstacle that I didn’t address, please leave a comment and I’ll see if I can help out. Also, if you can’t find a place to have your soil tested, let me know what city/state you live in and I’ll see if I can help find a soil testing lab close to you. Hello all. Sorry I’ve been too busy to update the site with new posts recently. I’ve been putting in about 80 hour weeks every week this summer trying to keep up with all of the field work for my project in Alaska. 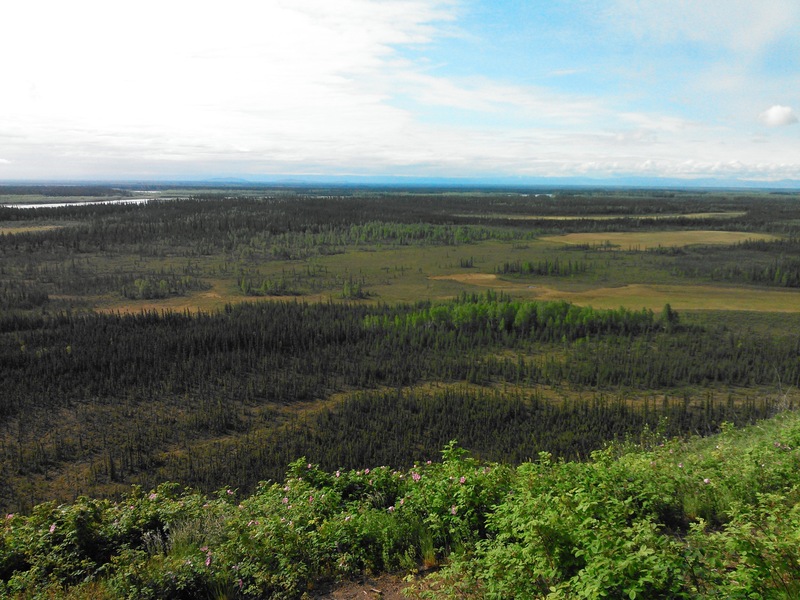 Saying Alaska has a short field/growing season is definitely an understatement! Anyway, I am working on putting together a college course focused on science communication. It would be taught in an agronomy department at an undisclosed land grant university. That’s about all I can tell you for now (I’ll tell you more in a few months). However, I’d like your input on what you would like to see in such a course. I know I have a pretty diverse audience that reads this blog in terms of educations, scientific training, age, etc., but I’m hoping I could get some good feedback from all of you. This class would include students in agronomy (soil and crop scientists), as well as other agriculture and possibly ecology majors that would consist of mostly upperclassmen and graduate students. The goal is to turn these scholars into well-rounded scientists that possess the know-how and experience to communicate what they do as scientists to a wide range of audiences. As you can see, I’m in the development stages of this class, and I would appreciate some ideas on activities, books, lecture topics, etc. that you think might benefit these students and help them learn to communicate their science. If you have any ideas, please drop a line in the comment box, or email me or tweet at me. I’m currently envisioning a class that brings in many guest speakers from a variety of backgrounds who will give their personal tips on communicating science to different audiences. These folks might include agriculture extension agents, soil scientist and agronomist consultants, journalists and reporters, graphic designers, salesmen in agronomy, and maybe even lobbyists and politicians! I think each of those examples would have a lot to contribute to the topic of communicating science, each with a different perspective. For activities for such a class, an essential activity would include having the students regularly read a peer-reviewed research article, then communicate the main points of the article to a general audience through different formats. Those formats could be as a news article, a blog post, an “infographic”, letters to the editor, and more. I would also like to have the students give a scientific presentation to a non-science audience, such as a K-12 classroom, a local garden club, 4-H or FFA club, etc. I’m also considering what books, magazine articles, or news articles I would have the students read that focus specifically on science communication. One book I would definitely include is “Don’t be Such a Scientist” by Randy Olson. Are there any books or articles that you would recommend? A thorough knowledge of current and upcoming social media platforms is crucial for scientists who really want to communicate their science. This class would include a variety of lessons and activities focused on various platforms, including Facebook, Twitter, Google+, Instagram, Flickr, Vine, Youtube, podcasts, and of course the various blogging and microblogging platforms. Are there any scientists, science communicators, pages, or accounts on any of these platforms that you think “hit the nail on the head” and would make great examples of how to communicate science? How about examples of how not to do it? Lastly, an important topic I want the students to understand is that as a scientist, every conversation they have that includes the question “what do you do?” is an opportunity to portray science in a positive light. Many people assume scientists are a bunch of old stodgy men in white lab coats and pocket protectors, when that is not at all the case. Scientists are normal people just like you and me who watch and play sports, drink beer, have hobbies, have families, etc. It’s important that non-scientists realize that. The two things scientists can do to help with the “scientist image” is to have a well-practiced elevator speech about what they do, and to learn to tell a good story. With that as a start, a scientist is well on their way to communicating their science. I’m hoping to develop this class around that premise. That’s my vision for this class, though it is definitely not set in stone yet. If you were teaching or taking such a class, what would you like to be included in the course? Thanks for stopping by, and for the suggestions! 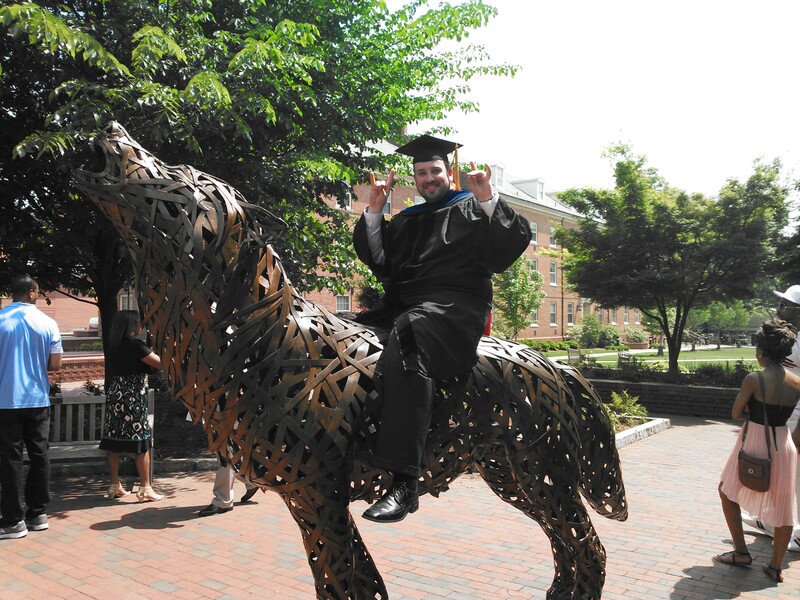 As of May 10, 2014 I am officially a doctor. After ten years of college I’m finally officially finished and now am a doctor of philosophy in soil science. It feels great to be finished. I want to give a special thanks to all of my family and friends that have supported me through grad school, especially my beautiful wife, Stacy. I couldn’t have done it without her. Another big thanks goes to my adviser, Dr. Mike Vepraskas. I learned a lot from that guy on both a professional and personal level. Thanks to Chris Niewoehner for all of his help with my research projects. Thanks to my Ph.D. and M.S. committee members for all of their help and guidance. Thanks to the soil science professors at Iowa State University for inspiring me to pursue this career path. Lastly, thanks to all of the faculty, staff, and students in the North Carolina State University Department of Soil Science. I couldn’t imagine doing my graduate work anywhere else. Some of you may be wondering what my plans are now. As many of you know, I’m currently working as a postdoctoral researcher in the University of Washington Department of Civil & Environmental Engineering. I’ll continue in this position for the foreseeable future. 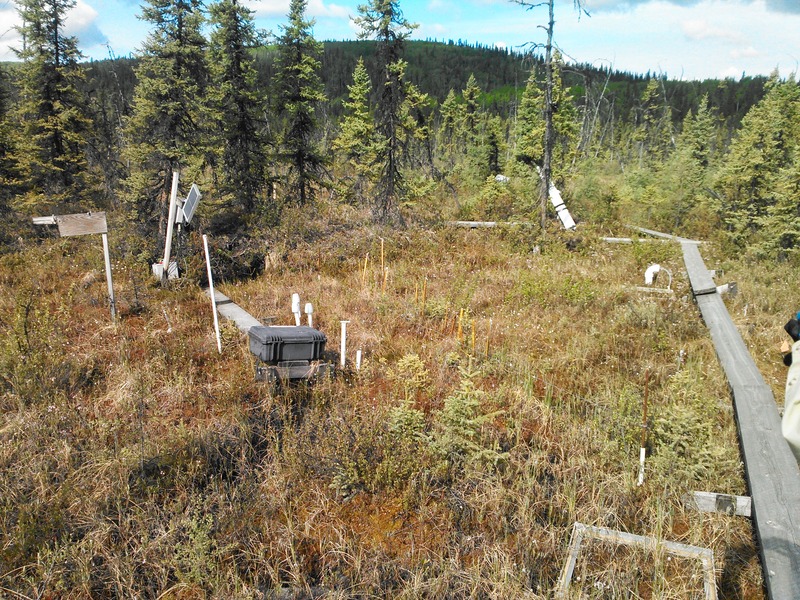 I really like the project, and I’m learning a lot about new root and rhizosphere research methods, and wetland methane biogeochemistry. I also get paid to hang out in Alaska during the summers! Eventually I hope begin a career in a soil science or Agronomy department where I can teach soil science, and continue my research. This has been my dream job since I was a sophomore in college sitting in my first soil science class with Dr. Lee Burras at Iowa State. It’s still my dream job, so I hope it works out. Wish me luck! Over the last year or so I’ve noticed a lot of websites, blogs, etc. offering water-saving techniques for container gardening. Some tips are useful and scientifically sound, but some are just plain wrong. As a person with a Ph.D. in soil science (and a minor in water resources), this drives me crazy. Because of that, I wanted to put some tips out there that will actually work! If you’re reading this blog post, it’s likely that you are a gardener that, like me, is either lazy or forgetful when it comes to watering. Despite my lack of a rigorous watering regime for my container plants, I still have a wide variety of beautiful specimens, mainly because I’ve found that these simple tips just plain work. This is the biggest decision you’ll face for container gardening, and the best way to make it easy on yourself. Get to know your local landscape and floral supply store (a real one, not a department store gardening section). Workers there will likely have some good advice on what plants do well with very little water. I highly recommend sticking to “succulents“, which are generally adapted to dry climates with little rain. Some great examples are Aloe vera, Crassula ovata (Jade plant), Euphorbias,Schlumbergeras (Christmas cactus) and any other cactus species. Succulents are generally “CAM” plants, meaning that they open their “stomata” (pores) at night instead of the day so that they can adsorb CO2 with minimal water loss (as opposed to opening stomata during the day like most other plants). Succulents also tend to have waxy skins that further limit water loss, and store lots of water inside their stout leaves or stems. Be sure to investigate the plant thoroughly before you buy it to see what it’s lighting, watering, and space needs are or might be once it matures. When it comes to containers you generally have two choices – terracotta (clay) pots and plastic containers. Both have advantages and disadvantages when it comes to limiting how frequently you will need to water your container plants. The traditional terracotta clay pots are porous, meaning that water can, and does evaporate through the side of the pot, and not just through evaporation at the soil surface, or transpiration through the plant. This can be desirable for a few reasons. For one, the color of the pot will actually tell you how wet or dry the potting soil is, at that moment. The wetter the soil is, the darker the clay pot will be. 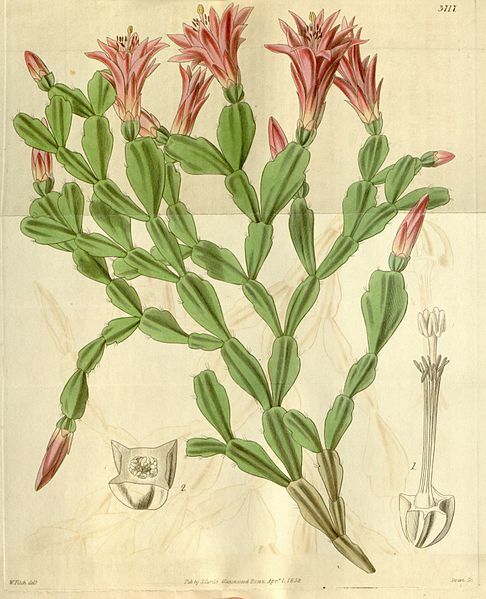 Some plants (succulent plants in particular) prefer moist but not wet conditions. 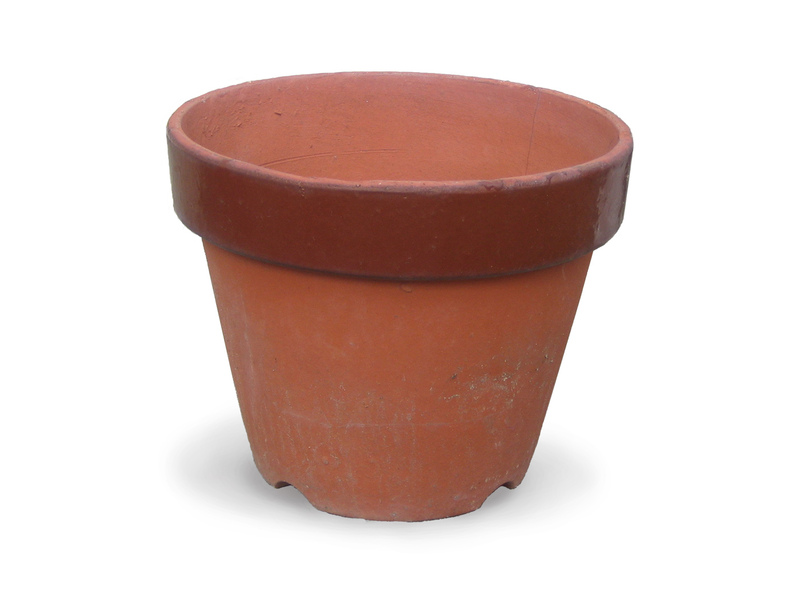 Terracotta pots do a great job of preventing saturated soil in the bottom of the pot, which may damage plant roots. The downside of terracotta pots is that the plants will need to be watered more frequently than with plastic pots. Plastic pots are not porous, so no evaporation occurs along the side of the pot. If you have plants that can tolerate wet conditions reasonably well, then using plastic pots is a great way to limit how frequently you need to water. If you don’t like the look of plastic pots, try placing the plastic pot on the inside of your container of choice. The less sun your plant is exposed to, the less water it will use. Shade reduces the temperature of the plant and soil, and thus the transpiration rates. Find out what sun/shade tolerances are of your plant of choice, and aim for something on the shadier side. Your plant may not grow as fast, but at least you won’t have to water it as much. Also, try to place the plant in a location where you will see it everyday. This will make it more likely that you will notice that the plant(s) needs watering. More than once I’ve forgotten to water a plant that I don’t see everyday. Picking the right location is a great way to make sure that won’t happen. Every single drop of water that you add to your container goes one of three places. It can be transpired through the plant, evaporated from the soil, or drained out the bottom of the pot. Adding mulch to the soil surface reduces how much water is evaporated from the soil. This is because the mulch shades the soil from the sun, which keeps the temperature down, and in turn reduces evaporation from the soil. One thing to keep in mind is that adding mulch is equivalent to adding a carbon-rich, nutrient-poor substance to the soil. This isn’t a problem, but be sure to add some fertilizer at the same time that you add mulch so that the plants don’t become nutrient-limited. There are a lot of gimmicky potting soils out there claiming to work miracles in terms of retaining water. Honestly, there’s not much difference between potting soils. I’d recommend just buying the potting soil that is the cheapest. If you follow the first four tips, then the type of potting soil you buy won’t make much of a difference. If you really want to go cheap, use topsoil from a corner of your back yard. It will work the same, as long as you lime and fertilize as needed.